A collection of elaborate, off-beat illustrations that feature animals comically engaged in the activities of commonly used idioms (ie: a bull in a china shop, an alligator that 'eats her words...). 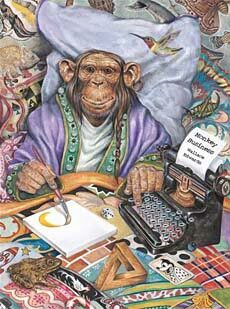 Under each illustration, a sentence or two describes the illustration and includes the idiom. The illustrations are clearly the star of this show, but this book could also be quite fun to use when teaching idioms. Full definitions are not include on the illustrated pages, but are included on a page in the back of the book. This format means teachers can present the illustration and sentence to the class, and have them try to pick out and define the idiom. This book is by the creator of The Cat's Pajamas. Check them both out! Below are sample pages from inside this book, both illustrating a commonly used idiom. 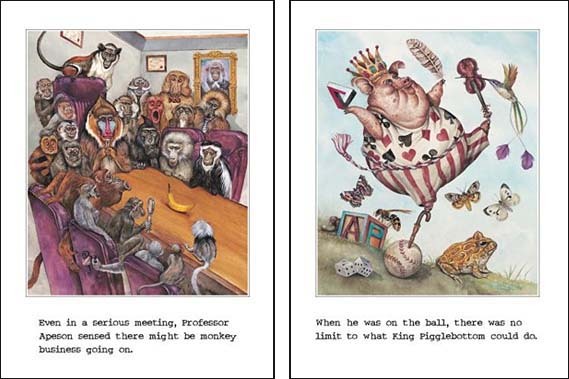 The illustration on the left depicts "monkey business" going on in what should be a serious meeting. And the illustration on the right depicts a king who is "on the ball." The text is likely legible below, but in case you can't read it: The text under the left picture reads "Eloise had a craving for snails, but she accidentally opened a can of worms." 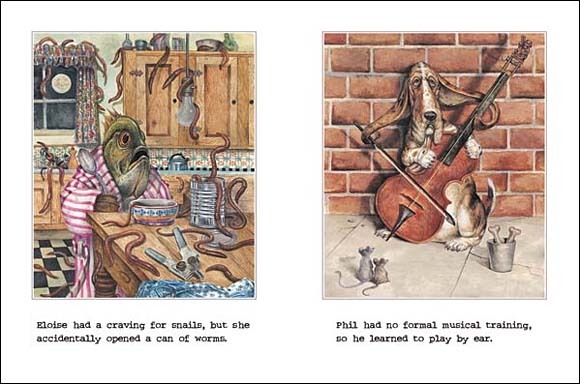 And the text on the right illustration reads "Phil had no formal musical training, so he learned to play by ear."